We like our new espresso machine, "bought" with grocery store points. It was our family's Christmas Eve treat for ourselves. The kids have a penchant for steamed milk, London Fogs and decaffuccinos. The adults like their lattés and cappuccinos. So far it has seen a whole lot of use. Everyone in the family now knows how to run through espresso shots and steam or froth milk. 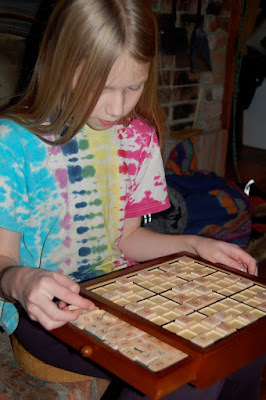 Next, below, Sophie is playing with our new sudoku board. Sophie really likes sudoku but finds the physical/tactile version much easier and more fun to use. Especially fun are the little drawers on each side of the board for storing the number tiles. 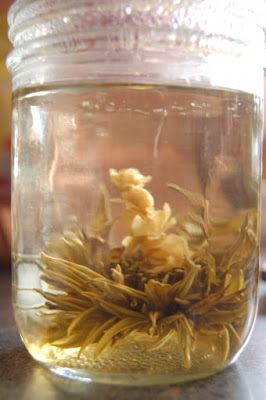 At the bottom, a bloom of Two Hills art tea, in this case Jasmine Fairy Flower Green Tea. We recently discovered Two Hills, a local importer of quality organic Chinese teas farmed and processed ethically. The regular Jasmine Tea is like something from another world. The art tea version, which "blooms" in your cup, adds visual appeal too. Our Christmas was as usual a fairly simple affair. Perhaps a little simpler than usual this year. On the gifting front there were a half dozen inextravagant gifts for each of the kids, a couple for the parents, plus a handful of "family gifts" like the ones pictured. Few gifts cost over $30, none over a hundred. Mostly useful things -- clothing, things for the bedroom, books. We had the usual cinnamon buns for breakfast, and a nice supper which included a small turkey for the meat-eaters. No extended family or friends over this year. Chuck was on call, though he only had to go into the hospital once during the day, which was nice. Sometimes I wonder if we have simplified too much. For many years we focused on special things to do through the holidays, on making things by hand, on contributing good deeds around the community and beyond. Lately we don't even do that much, besides participating in the flurry of Christmas performances and doing a fair bit of charitable giving. So it's just not that big a deal, Christmas. It's a time to be together as a family, to focus on the value of giving, and participate in a few special rituals. I'm not sure if it should be bigger. My kids' friends' families mostly make a much bigger deal over Christmas. The gifts, especially. Do mine feel embarrassed when their friends ask what their favourite Christmas gifts were and they have only a small humble few to choose amongst (a pair of mittens? a book? a jar of marmalade? ), none of which rate next to the laptops, wii's, iPhones, iTouches, X-boxes, Kindles and such that the others got? We had a nice Christmas. It wasn't the pinnacle day of the year (that would be the first Friday in August every year, the last day of SVI). No one's complaining. I guess we're doing okay. And this year we had only a tiny handful of paper and plastic, plus two cardboard boxes, to dispose of. Sounds like a wonderful Christmas, Miranda. We too had a simple day, with just us. Much smaller gifts that certainly don't compare with those of my dc's friends. Lee, that's basically the "formula" we use for gift-giving, though in practice it's not always so clear-cut, as I find that a "want" may be a book or an item of clothing, a "need" may be some clothes, and a want may also be a need, though we might choose to satisfy that need with something of better quality than we would otherwise. But yeah, that's my basic starting point, and it's a good one. It keeps the kids' expectations clear and reasonable, which avoids disappointment on their parts and pre-emptive gift-giving escalation on my part in an effort to avoid disappointment. Lovely! We like to keep it simple, although LEGO and some sort of robotics usually always make it in. :) I don't make a huge deal of it, but know the kids like to have something that is fun, so we have a tree, we make most gifts ourselves. But we keep it simple and stay at home. This year my favorite gift was a butter paddle and 3 wooden butter molds. Yay! I guess my kids are younger, but I get a yikes feeling at presents costing more than $100, or wii or laptops being presents (although my son did suggest a laptop and we once did a jungle gym as a joint present for the kids). Of course this year was very lean, so back to the sort of present price-range I used to do some years ago, and giving presents we had already bought not for anyone in particular. The most expensive presents I got cost $30. I solved the problem of my son's expensive playmobil tastes by giving him money, which together with his savings, should enable to afford some of the stuff he lusts over. I also find the concept of children getting multiple presents from parents weird. Is that the norm? We give one per child from parents, one from Father Christmas (and several really cheap stocking-fillers, $1-$2) and this year the children collectively gave each child and parent a present, which was parentally-funded, but when they are older will be child-funded. Grandparent presents from the kids were as usual homemade (calendars of photos and artwork done by all 3 kids). My kids all get multiple gifts from their parents. It's certainly the norm in North America. In our case keeping things to a single gift from parents would mean the kids would just get one gift total. We don't exchange personal gifts with extended family, and inter-sibling gift-giving is, well, a little capricious, since I leave it totally up to the kids and have never "facilitated" this assertively. The kids give to each other if the urge strikes them. And we don't do the Father Christmas thing. I got two gifts this year -- a lovely shirt and a few sheets of rustic hand-made paper from Sophie. If Chuck and I didn't give the kids multiple gifts, their Christmas gift haul would be similar to that. That seems just a little too lean to me for children. I don't know. Maybe that's my biases showing; maybe they'd be fine with it. But for now we're happy with the balance we've struck. It sounds as thought your family had a lovely Christmas. Thanks for sharing your celebrations. I'd love to read about some of your favourite drink recipes - the London Fog is a favourite of mine ever since you wrote about it. I wouldn't worry about them comparing their present load to others, or being unhappy even if they do. Children accept their own family norm. I was a child obsessed with numbers and ages, but my mother said that I never once counted the stocking fillers my sister and I got. It took till I was discussing presents with my DH as an adult before I realised that my family norm was not everyone's: we used to get one present from each parent, and only stocking fillers from Father Christmas, nothing big (we used one of my dad's socks for a stocking, so there wasn't space). In my experience, school is much more of a hotbed of comparison than the homeschooling group we attend. At the homeschooling group, it doesn't seem to be a topic of conversation, plus the kids get simpler gifts than the school friends. And of course, by the age of your children, they totally get the family values, even when they are exposed to different values. My 6 year old has told me about expensive gifts his one friend gets, and I've just said "you will never get a gift that expensive, we don't do that", and he accepts and understands it. We have always kept it simple, too. And sometimes I have had those kinds of feelings, also. We have talked about why we keep it simple and the effects of commercialism, etc. And also how many families go into debt that takes the rest of the year to pay off over Christmas. Now that I have a couple of grown children, I can see how much they appreciate it. There is even talk afoot of further simplifying. Hi Miranda, I so enjoy your blog. We live in the US and my husband and I are Asian immigrants who come do not come from cultures that celebrate christmas. However we enjoy the holiday and do a tree and some small presents for the kids. My kids are 6 and 8 and certainly exposed to a lot of ideas and what constitutes "cool" christmas gifts from school! We do at least half their gifts as shared gifts that they both can use or play with. They each got some fancy lego that was under $30 and books and some nice stationery (recycled paper pencils and sushi erasers!). Their haul was a lot less in quantity and price that most of the friends but they were happy. We don't make a big deal of giving presents in our culture anyway so at time the mass consumerism and hype leading upto christmas just takes my breath away. I think you had a great Christmas. We keep ours fairly simple too. Always stay home, and mainly its just dh, our two sons and myself. Sometimes my parents are here for the holidays. The kids do get multiple gifts from us however not huge on the money scale most of the time. Each will get one bigger (more expensive gift compared to the others) and then some smaller toys, perhaps item of clothing, books or games. This year we did give the boys a Wii. It really is a joint gift for the whole family and the first time we have ever purchased a gaming system for our house. We gave it alot of thought before we bought it. Certainly don't plan on making a $300 plus gift (with accessories and games) the norm for our gift giving. It was the exception this year. We try to keep it simple too, no hoards of gifts (although with my kids being the ONLY grandkids on both sides of the family, it can be hard). 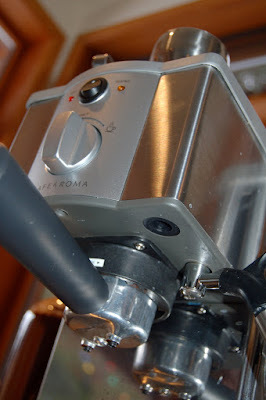 I love your new espresso machine - someday I'll have one!